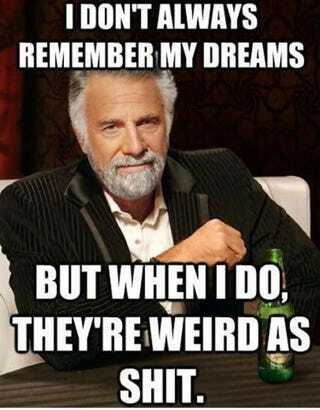 Guys I had some dreams and they were weird. I don't know what to think of them. Last night, I dreamt that a group of Ninjas (of both genders which both had awesome makeup and outfits) were outside the house my Aunt owns. Except my family I currently live with was there and not my Aunt. Anyway they had a pack of huskies with them that were being adorably threatening. They wouldn't answer to our questions to why they were there on our lawn. They were just there practicing Ninja and aerobic stuff. For some reason my family and I hung out by the big windows in front of the house where they could see us. However, we had our backs turned to the window. Once my family and I were talking about something not related to the Ninjas, we received text messages. On mine it was this person threatening to doxed me if I didn't give them something(never said what they wanted). They were threatening my Dad and brother too. Since Dad and brother wouldn't give into their demands he started release my Kinja/Twitter information to everyone. The dream ended with me looking out the window and seeing one of the ninjas(had very pretty feminine makeup on and the armor/Kimono hybrid was the most beautiful thing ever) was playing a harp with Twin Sai. The next dream was me putting on lotion. I am still upset from the events(plus other things) that happened this weekend. Are the dreams related or am I just weird?